This innocuous looking bit of kit is a laser. Or, as Dr Evil* might have it, a “lay-zor”. 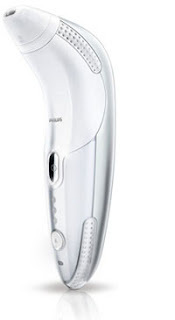 Actually, it’s a home facial re-surfacing gadget from Philips, and it’s called a Re-Aura. Retailing at just shy of £800, this has been in my beauty cupboard for the few weeks since it arrived. Because, I am, quite frankly, terrified of the flipping thing. But, I am a woman of my word and I went through all manner of pre-purchase checks before I signed up to use it, and so I WILL be using it twice a week for the next eight weeks. Actually, I have to admit to being very impressed with Phillips’ service in this matter, they ask you – and anyone else intending to use the system, whether a blogger or not – a lot of questions before they’ll let you have one. A little about your medical history, a lot of questions about your skin and a few questions about your routines, they’re very thorough, and extremely good at preparing you for what lies ahead. The Re-Aura is a form of laser dermabrasion, and the Philips website states that it reduces fine lines, evens skin tone and smoothes the texture of your skin. It’s said to be very good for skin that has pigmentation marks from the sun. I’ve read some remarkable testimonials, and so I’m going to give it a go. Only, not on my face. I have an inkling that it’ll be too much for my delicate little noggin, so I’m going to be using it on my decolletage. I met with leading dermatologist Dr Nick Lowe a couple of years ago, and he mentioned that if I was a client of his, the first thing he’d deal with is the sun damage that I have in that area (which I’ve felt self-conscious about ever since, thanks, Doc! ), but he didn’t give me any idea how to go about fixing it myself, so this is how I’m planning to sort it out! The Fine Print – Why yes, this is a PR sample. * True story, when MrLippie and I met, it was on a website where my screen-name was “Only Slightly Evil”. He can’t say he wasn’t warned. I’ll zap him if he steps out of line.